Now you can control when your devices come on and shut off! 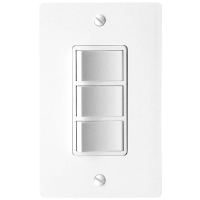 This triple-rocker switch from DewStop provides you with control over three devices while only taking up the space of one wall switch. It allows you to maximize your space, maintain a clean and beautiful look, and control more than one device in only one switch. It is best for use with dual speed fans with a light, fan/light/heater combinations, and fan/light/light combinations.